Many of the guitars on this page are part of my dealer inventory. Some are part of the permanent collection. EMAIL me for pricing on anything you are interested in. Below: Here are some of the FANTASTIC Burns London guitars. In my opinion, the absolute BEST value in electric guitars today, bar none. The quality is top notch. They are getting awesome reviews by the press in Guitar Player Magazine and even better reviews by the players like you and me at places like Harmony central. This row are my top sellers, there are many more models a little further down the page. Below: Here are the five main models of EKO guitars I import from Italy. All but the Camaro are available for under $300. 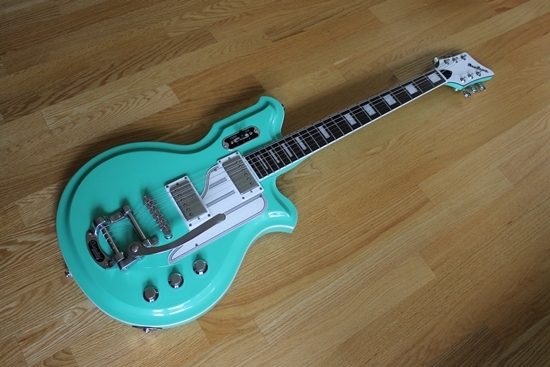 The VL480S guitar is by FAR my #1 selling guitar. I’ve sold more than 50 of these in the past year and they get AWESOME reviews from the buyers. They are extremely well made guitars at wickedly good prices. I guess that is why everyone is so pleased with them! The Camaro is a little more expensive, but a great deal on a killer guitar. Looks like a JAZZMASTER, plays like a Stratocaster, sounds better than both! Why pay $1000+ for a USA Made Fender when you can get a Camaro for under $500? Below: Here are the other EKO Camaro 2000 colors. The Camaro 2000 differs from the regular Camaro, as this has a strat style tremolo and the other has a Bigsby. At the end of the line is the incredible ST-YM, Yngwie Malmsteen Signature Model complete with scalloped fretboard! Last year I bought the entire collection for under $1,500, about the cost of ONE Fender Signature Series guitar! The collection includes: Eric Clapton, Jeff Beck, Yngwie Malmsteen, SRV and Jimmy Hendrix. WOW! Below: Here are a few of the DiPinto Guitars. I just LOVE these things. USA Designed guitars with FANTASTIC quality, most of the models are under $500. Everyone that buys one from me ALWAYS comments that the guitar is MUCH better than they expected. How often do you hear that? Here are some closeup pictures of the Los StraitJackets Custom. Most of these guitars are available in a bunch of different colors. Below: Here are a couple of Taylor guitars, one for special events and one for everyday messing around. Then, a couple of re-issues of Vintage designs: The Yamaha SGV which was originally available in the late sixties. It was not too popular then, so why the re-issue I have no idea. I like it, but typically if I like it the mass market hates it! Next to those is one of my all-time favorite designs, the VOX Phantom. I have a cool picture of Ian Curtis of Joy Division playing one. Feels great when it’s strapped on and it is an awesome player. However the body shape does not lend itself to any guitar stand I’ve ever found. That’s why most of these and the Domino copies from the 1960’s are always bashed up. Below: Here is a suite of new Burns Guitars. I firmly believe that these are the BEST quality re-issue guitars available anywhere. Once you play one you will understand why. I’ve owned plenty of Strat’s in my time and these feel, play and sound WAY better. Try one! Below: Epiphone G400 set-neck SG copy. Teisco Spectrum Re-Issue and Teisco May Queen re-issue. I will have a bunch of different Teisco coming in a few months. Send me an EMAIL if you want more information. Below: Here are most of the other EKO models, most of which I no longer import. If you are interested in one, send me an EMAIL and I can special order with 4-6 week delivery. Below: On the left is a NEPTUNE by Jerry Jones, who makes near perfect copies of the old Danelectros. Top quality, USA made guitars. If you ever get a chance to play one you will agree. Next to that is a whole bunch of different models from Italia Guitars. These I am also a dealer for these, so if you are interested in any model, let me know. They are all available in a bewildering number of colors. I’m really digg’n that Red White & Blue Mosrite Electric! Dave here from A Joyful Noise Music Store in Milton Fl. I was wondering if you might help me out. I just got in an EKO Camaro that needs restoration. Do you carry any parts? specifically a pickgard and possibly pickups. sorry, we do not carry EKO parts. I have a Burns Steer and the chrome plate around the pickups is in bad shape. Do you have an idea where I could get one? is the red white blue japanese reissue Mosrite guitar for sale? Hi. 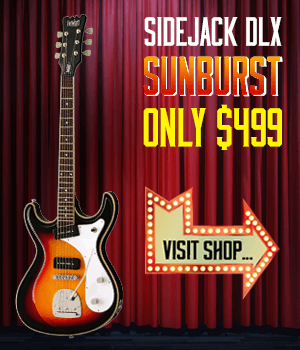 How much for the blueburst Mosrite 2002?.. Hiya.just paid £30 for a Fleetwood electro acoustic..why I don’t know.but it plays and sounds great.electrics are sound etc.where do they come from? Number FW558/red……any ideas? Do you have a blue or white Johnny Ramone Japan reissue for sale? Price?